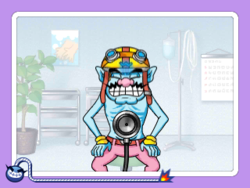 Bedside Manners is one of Tiny Wario's microgames in WarioWare: Smooth Moves, and returns as one of Wario Deluxe's microgames in WarioWare Gold. 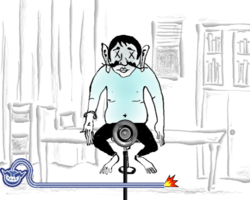 The player must diagnose Wario's chest by searching around his body until the stethoscope finds the injury spot. In Smooth Moves, the Wii Remote will start to vibrate as the spot gets closer. In Gold, Wario will look distressed and shake his head "yes" as the spot gets closer. This page was last edited on April 15, 2019, at 00:19.